It’s Chanukah (sometimes spelled “Hanukkah” and pronounced HAH-new-kah), and you are planning on attending a public menorah lighting. Here’s what you need to know. First of all, there is nothing you need to bring and no particular way to dress. 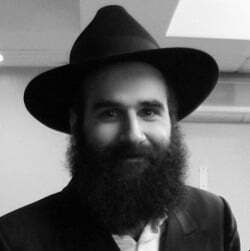 If you are a guy, you may want to have something—preferably a kippah—to cover your head. Also, if it is going to be an outdoor menorah, you may be outside for some time, so dress accordingly. This event is truly open to the public, so please invite your neighbors, friends, neighbors’ friends, and friends’ neighbors. Obviously, kids are more than welcome. Wait. Why Are We Doing This? Chanukah marks the miraculous victory of a ragtag band of Jewish freedom fighters who ousted the powerful Syrian Greeks from the Holy Land well over 2,000 years ago. It was a victory of religious freedom against an oppressive regime of heavy-handed pagans who tried to force their culture and beliefs on the Jewish people. Then, upon entering the newly liberated Holy Temple in Jerusalem, the victorious Jewish armies found a small jar of pure olive oil with which to kindle the lamp that always burned there. Miraculously, the oil—which was enough for just one day—burned for eight days, the time it took to bring fresh supplies. The sages declared that lights be lit in every Jewish home to commemorate the miracle, publicly marking G‑d’s providence for His people and the triumph of light over darkness. 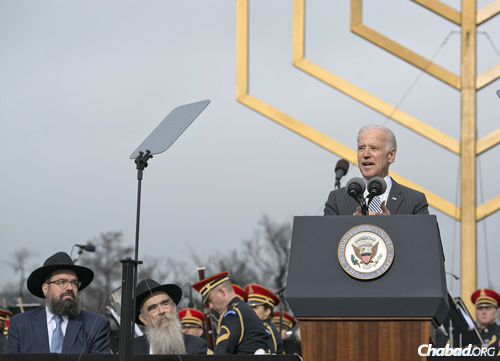 In recent times, the celebration spilled from Jewish homes and synagogues into the public arena, with Chabad Lubavitch–sponsored public menorahs appearing in public squares, government buildings, shopping malls and common areas all over the world. It’s a global phenomenon, and you are part of it! The centerpiece of the program will be the lighting of an oversized menorah (me-NO-rah), the candelabra lit in honor of the Chanukah holiday. In Israel it is called a chanukiyah, but Jews in the rest of the world use the traditional term “menorah,” which means “lamp” in Hebrew. 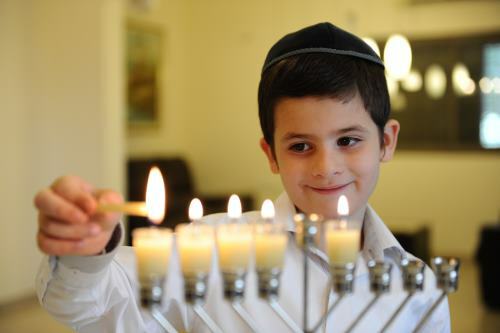 Every night of Chanukah, an additional flame will be lit, until all eight will all be burning on the 8th night of Chanukah (the central flame is not among the 8; it is considered a “helper” flame to light the others). In addition to some short blessings before the lighting and some songs after, there is not much else that needs to be on the program. You can expect there to be some light refreshments, often doughnuts or potato pancakes called latkes (LOT-kehs). You can read why here. 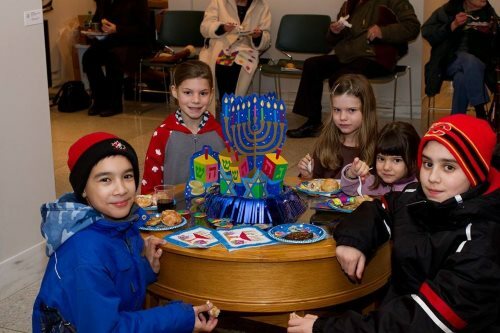 These kids in Regina, Saskatchewan, Canada, were glad to get indoors to warm up and enjoy some Chanukah treats. The program may very well include crafts for kids, Jewish music, and even a genial fellow dressed up as Judah the Maccabee, the hero of the Chanukah story (he’ll be happy to pose for a picture with you). Three-year-old D.J. 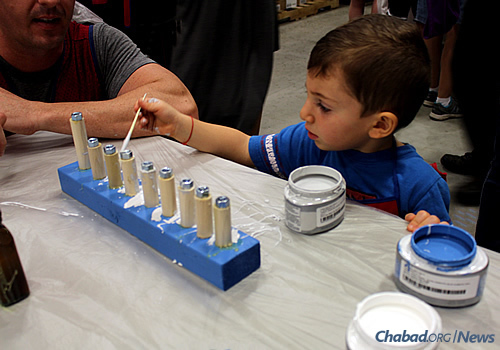 Becker paints a menorah at a Chanukah workshop sponsored by Chabad at St. Johns County in Florida and Lowe's home-improvement store. Sometimes public menorah lightings are held in tandem with cartop-menorah parades. So if you see a string of vehicles with lights mounted on top, know that they are part of the program. 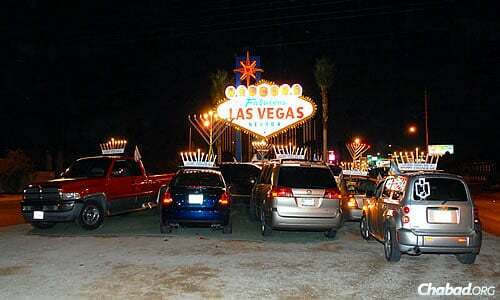 Las Vegas awash in even more light from these menorahs. You may be called up to kindle the menorah or even say one of the blessings. Feel free to ask the rabbi to review your part with you, so you’ll be sure to know what to do when. You can freshen up on your pronunciation of the blessings here, and hear some of the traditional tunes here. If you are asked to give a talk, you can find lots of great content and info at the Chanukah Megasite. Even if you attend a public lighting—and even if you were the one to light the menorah—you still need to do so at home with all the usual blessings and prayers. On the subject of blessings, it is possible that the traditional blessings will not be recited before the kindling of the public menorah. Why is that? Probably because the lighting you see does not conform to Jewish law. Here are two common reasons why: a) the menorah is powered by electricity instead of old-fashioned fuel and wick; b) the menorah is not being kindled at the prescribed time (on the eight evenings of Chanukah after sunset). You can assume that you are more than welcome to take pictures and videos. Post them on social media and let everyone know where you are. 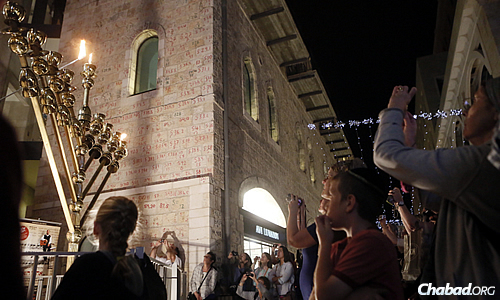 After all, the purpose of Chanukah is to #sharethelight. 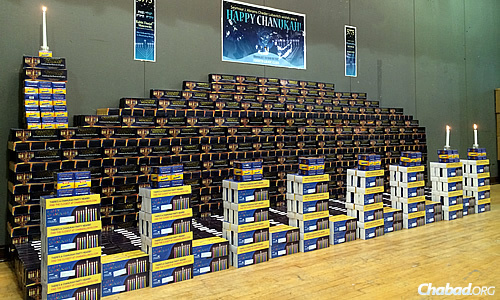 There’s a good chance that someone is distributing menorah kits. If you do not have a menorah of your own, please take one and use it. If you already have a menorah, please take a kit and share it with a friend who can use one. 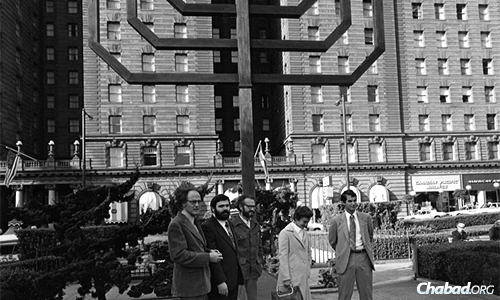 The “menorah” menorah was constructed out of 1,770 rectangular kits, purchased with donations that far exceeded expectations. 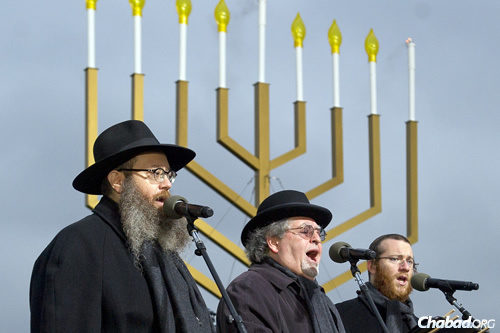 Looking for a public menorah lighting? We’ve got thousands of events listed here. Invited to a conventional Chanukah party? Learn what to expect here. 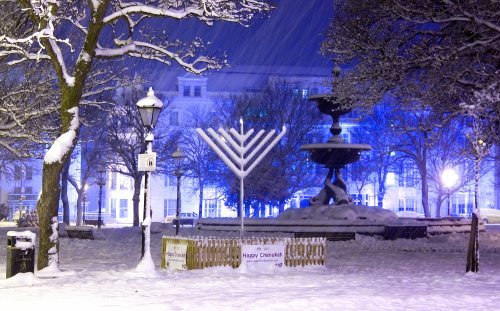 Curious how these public menorah lightings became common? Read up on it here. Need instructions on how to light your own menorah? Learn what to do here. 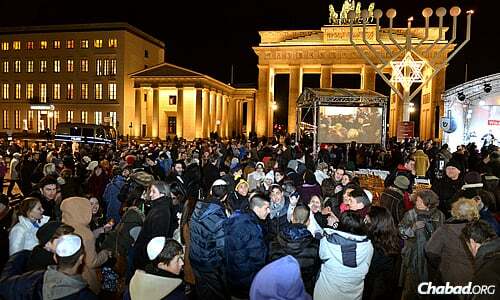 Want to watch public menorahs lit in major cities throughout the world? Jewish.tv offers an online archive of Chanukah menorah lightings going back more than two decades! Need more Chanukah info? We’ve got you covered here. Traveling This Chanukah? 5 Things to Remember!